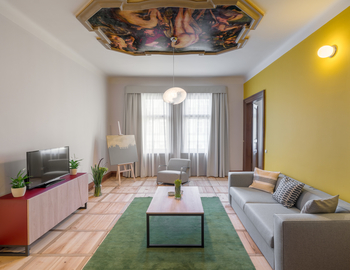 The Art House is ideally located in the very heart of Prague by the bank of Vltava river. It is just around the corner from the Old Town Square and Charles Bridge, both being within 5 minutes walking distance. When entering the apartments, you immediately notice the original interior design with spacious rooms fitted with cosy wooden floors. Each apartment has captivating room decorations and bathrooms fitted with marble tiles. All bedrooms have comfortable high-mattresses for a good nights sleep. Fully equipped kitchen for self catering. Rates include free daily cleaning, towels and bed linens as well as organic products and toiletries. 24/7 reception only 5 minutes away at the 3 Epoques residence where we will gladly help you with anything you might need during your stay. Private parking is available near the residence for an additional fee (advance reservation needed). This was one of the best apartments I have ever stayed in. The location was great, spotlessly clean and spacious. The unexpected bonus was that the apartment was cleaned every day. The pillows were a little too soft for me but seriously I'm being ridiculously picky! The location could not be any better. A large, clean and quite apartment centrally located to the old town square and Charles bridge. The bar next door was an added gem. I will stay here again the next time in Prague. Enjoy comfort and calm atmosphere in this bright and colorful apartment with spacious and originally designed rooms. The apartment offers a large living room with a fully equipped kitchenette and a modern, marble fitted bathroom with a shower. It can accommodate up to 4 guests where 2 guests can sleep on the comfortable king sized bed in the bedroom and other 2 on the comfortable pull out sofa in the living room. 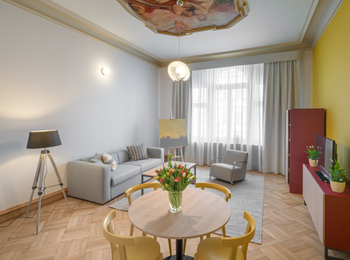 Staying in this spacious apartment you'll enjoy large living areas with exclusive interior design, typical for the center of Old Town. The apartment offers a balcony, two bedrooms with comfortable king sized beds, large living room, fully equipped kitchen and two modern, marble fitted bathrooms (one with a tub, one with a shower). It is ideal for 4 guests, but other 2 guests can sleep on the comfortable pull out sofa in the living room.